Aglo Systems custom manufactured bathroom wall lights for a multi-storeyed luxury apartment building located on Marne St in South Yarra VIC. 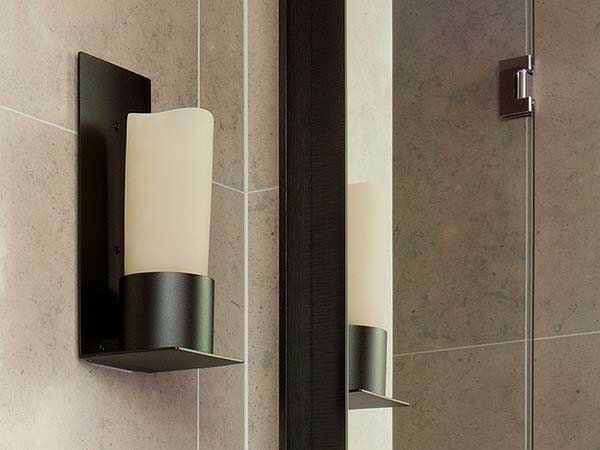 Designed by Electrolight, the bathroom wall lights were manufactured by Aglo Systems using aluminium parts, with the fitting achieving a premium appearance while meeting budget requirements. While the welds were performed on non-visible surfaces to maintain the design aesthetic, the resin shade, which mimicked a candle, was held by two threaded components. Aglo used a custom tool for installation to minimise the fixings, with the two screws provided for mounting the light to the wall partly hidden behind the faux candle. A bracket fitting that could hold two large light sources as close to each other as possible, was also designed and fabricated by Aglo Systems. The bracket remains concealed once placed behind the wall sconce.